Reactive antigenic epitopes on presumed autoantigens of biologic interest have been examined by many researchers. The central third complementarity-determining region (CDR3) residues of a human monoclonal anti-proteinase 3 (PR3) antibody contained many negatively charged aspartic acid residues, perhaps contributing to its reactivity with positively charged PR3 regions. Examination of four other human monoclonal anti-PR3 antibodies shows a number of negatively charged residues within their CDR3 regions. Mapping of segments of linear PR3-epitopes reacting with anti-neutrophil cytoplasmic antibodies (ANCA) demonstrated a preliminary estimate of structures contributing to antigenic determinants. T-cell epitopes on PR3 are reported in studies of chronic myeloid leukemia. These T-cell epitopes appear to be human leukocyte antigen (HLA) A2.1 restricted. Exactly how polyclonal or even monoclonal human autoantibodies actually bind to their respective antigens on PR3 is still not completely understood, but because of its strongly overall positive charge, PR3 should show at least an electrostatic attraction for negatively charged amino acids within the antibody-combining site. We recently followed this line of reasoning in attempting to construct a three-dimensional model of the combining site of a monoclonal human IgM anti-PR3 antibody (WGH1) using a molecular modeling technique that made use of knowledge-based homology modeling to obtain minimum-energy conformational approximations [1*]. This interesting antibody, which originated from a patient with Wegener's granulomatosis (WG) , showed the unique amino acid sequence DFWSGYYRDQYY within the CDR3 region of the heavy chain. The CDR3 contained an unusually high number of negatively charged aspartic acid residues (D), which were postulated to be capable of reacting with the positively charged epitopes of PR3. Moreover, our molecular model indicated that the CDR3 structure of the monoclonal autoantibody WGH1 appeared to be involved in the formation of a loop that lay on the surface of the first variable region of the heavy chain and thus was accessible for interaction with presumably positively charged residues on PR3. Moreover, the light-chain CDR3 of this antibody showed a glutamic acid (E) at position 100, towards the end of the light chain. Glutamic acid is another amino acid with a strong negative charge, also capable of reacting with positively charged PR3. For these observations to bear weight, it was assumed that the CDR3 of WGH1 constituted the central portion of the antibody-combining site. Recent observations by Corper and coworkers concerning the crystal structure of a human IgM rheumatoid factor Fab binding to its presumed Fc autoantigen, surprisingly indicated a rather novel topology of the autoantibody-antigen interaction, namely, that although the CDR3 region of the antibody was engaged, it appeared to be only at the edge of the complementarity-determining region rather than in the middle . These latter observations could, of course, suggest that rheumatoid factors may have primary specificity for something besides the Fc of IgG, a possibility that makes some of our previous observations all the more interesting [4,5]. The report by Corper and coworkers was the first description of the three-dimensional structure of a human autoantibody reacting with its presumed autoantigen. That landmark observation may imply that rheumatoid factor reacting with the Fc of IgG represents only part of the specificity of the antibody-combining site itself. The same might be said of other autoantibodies, such as human antibodies reacting with PR3 or myeloperoxidase. Since the beginning of modern clinical immunology around the middle of the 20th century, many human autoantibodies have been defined on the basis of the original assay used to detect them. This is the case with rheumatoid factors or anti-nuclear antibodies and possibly also with C-ANCA and anti-PR3 antibodies. It is possible that the methods used to detect various autoantibodies unduly influence our final judgement of what the initial antigenic stimulus was for their generation. Perhaps this misgiving can be laid to rest once the crystal structure of human anti-PR3 reacting with PR3 has been defined, if the CDR3 interactions with the relevant PR3 residues are shown to be of very high affinity and solidly tight within most of the antibody-combining site surface. While we were busy sequencing and later modeling the variable (V) regions of our mAb WGH1, Sibilia and coworkers in France published the V-region sequences of five other human monoclonal autoantibodies reacting with PR3 [6*]. Those workers' CDR3 heavy-chain sequences show many similarities to those we found in our WGH1. Four heavy-chain CDR3 sequence motifs recorded by the French group are shown in Table 1. It can be seen that human monoclonal IgM anti-PR3 WG1 showed only a single negatively charged aspartic acid (D), in the very center of the CDR3. On the other hand, mAbs WG2 and WG3 showed multiple negatively charged glutamic acids (E) or aspartic acids (D) throughout the heavy-chain CDR3. mAb WG4, however, showed only a single aspartic acid, near the center of the heavy-chain CDR3. The light-chain CDR3 regions and the adjoining sequences of several of these monoclonal antibodies are also shown in Table 1. WG2 showed both aspartic acid and glutamic acid together in Framework 3 region, just before the light-chain CDR3, whereas WG3 and WG4 showed an aspartic acid at the end of the JK3 segment. In general, though the French group's sequences have not been subjected to modeling, their results also uphold the notion that negatively charged residues within or near the CDR3 regions may help determine anti-PR3 specificity. For the negatively charged residues shown in Table 1 to be important in the interaction of these regions of the monoclonal anti-PR3 antibodies with antigenic determinants on PR3 (an overall positively charged molecule), one must assume that the actual reactive three-dimensional or linear determinants on PR3 would conversely have to bear strong positive charges. At present this particular point is not clear, since an overall scheme defining reactive PR3 conformational determinants has not been identified. Stereogram α -carbon representation of PR3 and trypsinogen, showing carbon trace backbone in yellow, color-coded to indicate the B factors of trypsinogen from yellow (low B factor) to red (high B factors). Antigenic sites identified as linear regions located at the N-terminal regions of the molecule are shown as blue lines. Reproduced with permission from [14*]. Sequence in parentheses is PR3. Amino acids shown in bold type are very negatively charged. Precise designation of reactive linear or three-dimensional determinants on presumed autoantigens such as PR3 or myeloperoxidase has often proved a formidable task. With respect to PR3, the initial report by Bini and coworkers [7*] indicated that C-ANCA sera from patients with WG showed little or no binding to recombinant PR3 (rPR3) expressed as a fusion protein in Escherichia coli. These workers found that the antigenicity of PR3 was totally destroyed by exposure to reducing agents or to low pH (<3.0) and was lost or considerably diminished after boiling in SDS. They concluded that the reactive sites on PR3 must be conformational epitopes. Subsequent studies by Witko-Sarsat et al , using a baculovirus/insect cell system, produced another recombinant PR3 as a glycosylated intracellular and membrane-associated protein. Rabbit anti-PR3 IgG recognized both rPR3 and neutrophil-derived PR3; however, sera from patients with WG reacted only with neutrophil-derived PR3 and not with the baculovirus rPR3 preparation. These studies also showed that PR3 antigenicity was conserved in 8M urea or 1% SDS, indicating that the antigenic epitopes were maintained by disulfide bonds even in denaturing conditions. This particular PR3 preparation did not show serine proteinase activity, and the authors indicated that absence of serine protease activity and of C-ANCA reactivity suggested that this rPR3 exhibited aberrant folding. Other studies conducted in this report also indicated that autoantibody recognition of PR3 epitopes appeared to be polysaccharide-independent in polymorphonuclear leukocyte (PMN)-derived PR3. Additional studies of rPR3 were reported by Specks et al[9,10]. A stable expression system for conformationally intact rPR3 used the human mast cell line HMC-1 [9*]. This rPR3 preparation showed serine preotease activity and reacted with most C-ANCA positive sera from patients with WG. Of interest in this study was the fact that two additional proteins of ~ 47 and 83 kDa were co-immunoprecipitated by PR3 specific antibodies from lysates of both HMC-1 as well as U937 cells. Similar findings had previously been reported by Goldschmeding et al  in immunoprecipitates using C-ANCA patient sera from neutrophil granule extracts. Characterization of these additional proteins eventually will be of interest. When Specks and coworkers completed a comparative study of indirect immunofluorescence and ELISA results using a large number of C-ANCA-positive sera and other samples from patients with biopsy-proven WG, they found that three C-ANCA-negative patients with biopsy-proven WG showed rPR3-ANCA detectable on HMC-1 PR3 cells. Other workers have also reported positive indirect antigen capture ELISA results obtained using the open reading frame of PR3 without the prepro-peptide and using a Pichia pastoris expression system . In that study, 60% of sera from patients with WG bound to recombinant product. Precise localization of reactive conformations within recombinant PR3 must now be attempted. In 1994, we attempted to define linear antigenic regions within the surface-exposed portions of PR3 by using overlapping peptides derived from the primary amino acid sequence [13*]. That study was facilitated by Dennis Underwood's creation of a three-dimensional model of PR3 on the basis of the sequence homologies between PR3 and 20 other serine proteases. Eleven surface-exposed regions composed of 7mers of PR3 linear sequence were identified, none of which, curiously, showed any primary sequence homology. Two of these 7mer peptide epitopes (ATVQLPQ and RVGAHDP) were studied in detail. Inhibition of dilutions of WG sera C-ANCA staining of PMNs on slides was demonstrated by preincubation of WG serum with each peptide. Moreover, IgG F(ab)2 fragments from rabbit antisera to each of the peptides showed C-ANCA staining of human neutrophils. 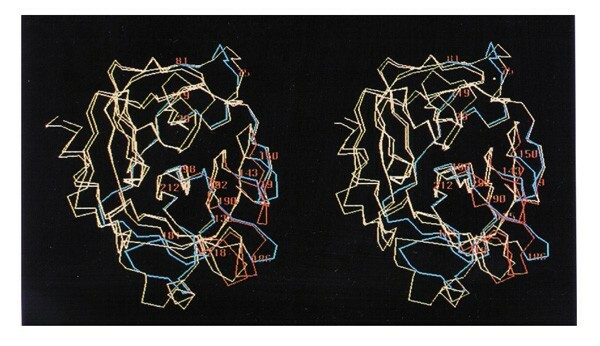 In 1996, Fujinaga et al reported the crystal structure of PR3 and suggested on the basis of our data on reactive linear epitopes that these reactive regions might correspond with flexible parts of pro-forms of the serine protease enzyme [14*]. These workers suggested that the flexible regions in the pro-enzyme forms of PR3 might be secreted or otherwise externalized on the cell surface and thereby trigger the antigenic stimulus in WG. An illustration of the three-dimensional carbon trace of PR3 with the linear determinants we suggested as antigenic sites reacting with C-ANCA antibodies is illustrated by the blue outlines in Fig. 1, adapted from Fujinaga's report. Clearly, more work is needed to define conformational antigenic determinants present on PR3. Additional studies of antigenic epitopes on PR3 were later reported by Chang et al , who used dot blots, ELISA, and synthesized 10mers of PR3 sequence on pins. These workers found no peaks of specific ELISA reactivity corresponding to regions of PR3 overlapping linear sequence, and no difference between sera from patients with WG and normal controls. Chang et al used an ELISA assay system very similar to the one we used, but they tested 10mers instead of 7mers. Their much longer peptides may somehow have obscured the relevant antigens when they performed the tests. However, additional epitope mapping studies recently reported by van der Geld and coworkers  again showed five reactive regions and indicated higher values with WG sera than those seen with normal controls. If immune reactivity to antigenic determinants of PR3 is fundamental to pathogenesis in WG, then one might also expect that such patients would develop cell-mediated immune reactivity to T-cell-reactive determinants on PR3. Several recent observations by Molldrem et al relating to myelogenous leukemia [17,18] have indicated that a 9mer peptide of PR3, VLQELNVTV (residues 169-177), was restricted to HLA-A2.1 and could be used to sensitize a human leukocyte antigen (HLA)-A2.1 T-cell line specific for the 9mer PR3 peptide VLQELNVTV. Specific lysis of the cells carrying PR3 peptide at an effector-cell to target-cell ratio of 50:1 was recorded. Since PR3 was known to be present in high concentration in the primary granules of both acute and chronic myeloid leukemia blasts, this approach was undertaken as a possible strategy for therapy of such hematologic malignancies as acute or chronic myelogenous leukemia recurring after aggressive chemotherapy. Later work by the same group indicated that the PR3 peptide VLQELNVTV-specific T-cells obtained from two HLA-A2.1+ normal individuals showed specific cytotoxicity for the nonpolymorphic PR3 peptide and could inhibit chronic myeloid leukemia colony-forming units . These observations are of great interest: they suggest why no particular narrow HLA phenotype has ever been identified in WG, since approximately half of normal individuals are HLA-A2.1+. If cell-mediated immune reactivity to antigenic determinants on PR3 required only the presence of HLA-A2.1, more than half the general population expressing HLA-A2.1 would be susceptible, so that clearly other immunogenetic factors must be involved in the eventual development of WG.